Provide a two-lane extension of existing Litton Lane west to Graves Road to improve mobility in the Hebron area. Extending existing Litton lane to Graves Road will provide improved east-west mobility through northern Boone County. In conjunction with the proposed I-275 interchange with Graves Road, this project will provide an alternative route for trucks and employees at the distribution centers on Litton Lane to access I-275. This will decrease vehicular demand at the Litton Lane intersection with KY 237 (North Bend Road). This project will consider opportunities to construct truck staging area(s). 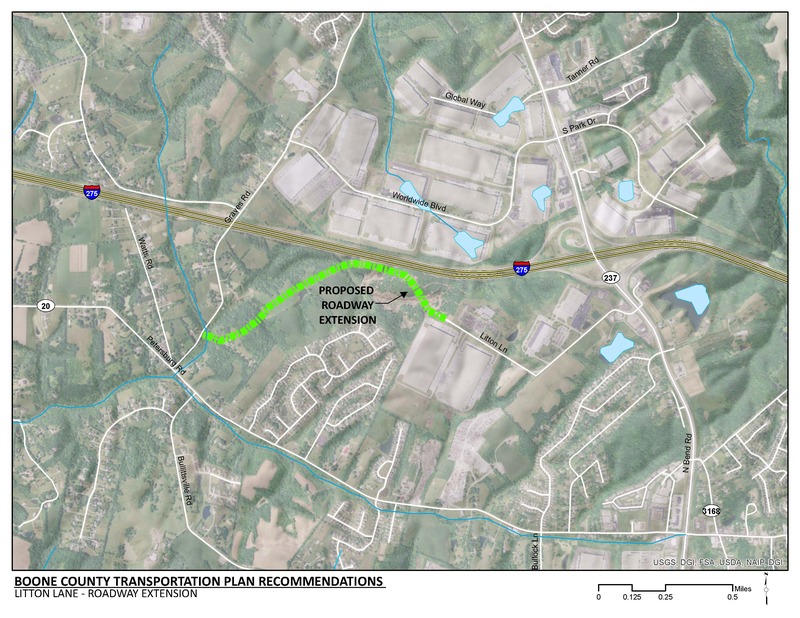 The pedestrian facilities included in this recommendation will connect to the proposed multi-use paths along the improved Graves Road, Bullittsville Road and KY 20 (Petersburg Road). This project is consistent with Boone County’s overall goal of improved bicycle and pedestrian safety and connectivity. Click HERE for a map of multi-use paths in Boone County. Additional right-of-way will be needed to implement improvements. The project will need to be coordinated with the I-275 interchange project at Graves Road to identify the appropriate alignment and location for connecting to the existing roadway network. At the signalized Litton Lane intersection with KY 237, there are long queues of traffic resulting from a high volume eastbound left turn from Litton Lane onto northbound KY 237. Although, dual left turn lanes are provided on the eastbound approach, most vehicles are traveling to I-275 which results in a disproportionate use of outer (or right) left turn lane. The queue of traffic on Litton Lane at the signalized intersection with KY 237 often blocks the entrances to businesses along Litton Lane. Distribution facilities along Litton Lane generate a demand for both long and short term truck parking. Since truck parking is limited in this area, trucks are parking in nearby private parking lots and along the shoulders of the roadway. The additional weight of the trucks in these locations has led to rutting and potholes in pavement that was not designed for truck parking. Litton Lane serves a mix of industrial and commercial land use. There are several distribution facilities along the route that contribute the volume of truck and employee traffic. The logistics of the distribution facilities along Litton Lane generate a demand for both long and short term truck parking. Since truck parking is limited in this area, trucks are parking in nearby private parking lots and along the shoulders of the roadway. The additional weight of the trucks in these locations has led to rutting and potholes in pavement. The frequency of crashes along Litton Lane is 31 percent higher than the statewide average of similar roadways. During the development of the Boone County Transportation Plan, there was a pedestrian fatality on Litton Lane. There is an active Boone County project to install sidewalks along the existing Litton Lane. TANK Fixed Route 39x runs along KY 237 through the intersection with Litton Lane.